When it was first announced there was an outcry from UK universities over the cost implications of the new policy. In response, on 7th September last year the UK Minister for Universities and Science David Willetts made an additional £10 million available to 30 research intensive universities to help pay OA transition costs. But the controversy has continued regardless, and in January this year the House of Lords Science & Technology Committee launched an inquiry into the policy. The subsequent report roundly criticised RCUK for the way it had been implemented, and concluded that lack of clarity about the policy and the guidance offered was ‘unacceptable’. 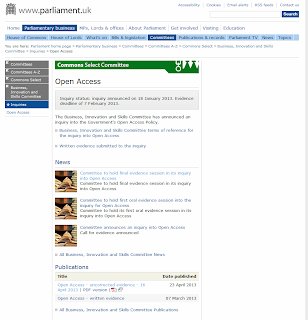 RCUK responded by making a number of “clarifications”, and extended the permissible embargo period before research papers could be made available under Green OA from 6 and 12 months, to 24 months — an extension that led many OA advocates to complain that a bad policy had been made worse. In the meantime, the House of Commons Business, Innovation and Skills (BIS) Select Committee had announced its own inquiry, which at the time of writing remains ongoing. During this inquiry a number of new issues have emerged, including complaints that some publishers are exploiting RCUK’s new policy to pump up their profits (profits that many believe are already unacceptably high). There are concerns, for instance, that the £10m in additional funding that Willetts provided is being used inappropriately. At the centre of these new concerns is Elsevier, the world’s largest scholarly publisher. When last September Willetts made an additional £10 million available to research intensive universities it was widely assumed that the money had been provided to help them meet the costs arising from the fact that when the new RCUK policy came into effect on April 1st this year their researchers would have to start paying to publish their papers. Critics argue, however, that at least some of this money is being used to pay for papers that have already been published in subscription journals. Specifically, they cite the fact that on December 20th last year Elsevier approached JISC Collections — the organisation that procures digital content on behalf of UK research institutions — and offered, in effect, to sell back to UK universities the papers that their researchers had published with it during 2012. That is, it offered to make papers that had been published in subscription journals OA retrospectively. Elsevier’s offer came to light on February 11th in a submission made to the BIS Inquiry by OA advocacy group SPARC Europe. SPARC complained that the £10m was being used in ways that Willetts had not envisaged when he made the money available, since Elsevier’s offer had nothing to do with Open Access. Rather it was being used to buy “retrospective back-catalogue access.” Moreover, SPARC added, Elsevier had “already been paid, in the form of subscriptions, for handling these articles”. Nevertheless, in light of claims that these articles had already been paid for by means of journal subscriptions, and that many of them would in any case become freely available once Elsevier’s green embargo expired (The embargo for many of Elsevier’s journals is 12 months. Moreover, authors can make their manuscripts freely available immediately after acceptance), I asked RCUK if it did not feel that taxpayers’ money could have been better spent. When I asked Wise how many universities had taken up Elsevier’s offer she said that 12 institutions had responded, and that “under 700” papers had been purchased. And for this reason, Wise explained, the offer had closed at the end of April. “We needed the numbers to be finalised in order to accurately reflect them in the 2014 list prices”. For all that, it is difficult to judge whether the price that participating universities have paid for the articles is fair and reasonable, not least because Wise declined to say how much money had changed hands, or what the average price per paper had been. Nevertheless, we could make a guestimate. If, for instance, we assume that the 700 papers had been published in journals that charge Elsevier’s highest APC level of $5,000, and if we assume that all of these articles were sold at a 50% discount, then the total would presumably have been around $1,750,000 (£1,151,543) — some 11.5% of the sum that Willetts provided in additional funding. If, on the other hand, we assume the papers were charged at the industry standard for Hybrid OA of $3,000, then the total would be more like $1,050,000 (£690,925). The most intriguing question, however, is why 12 UK institutions would have spent taxpayers’ money buying articles that their own researchers had produced, that the research community had already subsidised through journal subscriptions, and which would have become freely available to all in the near future? Alas, it is not possible to answer this question. JISC Collections emailed all 12 universities on my behalf inviting them to speak to me, and giving them my details. Not one of them contacted me. Why? Alma Swan, director of European advocacy at SPARC, suspects that this is because Elsevier would have insisted that, as a condition of the sale, participating institutions would have had to sign a non-disclosure agreement (NDA) — a point to which we will return. JISC Collections suggested another explanation for why the universities had taken part: “Some of the institutions I spoke with considered participation in the offer because they wanted to make strategically important articles immediately open access on a CC-BY licence”. Be that as it may, we are still left struggling to judge the fairness of Elsevier’s offer. Not only do we not know how much it charged to free the papers, but we have no idea what impact liberating them would have had on Elsevier’s subscription revenues, or on any potential secondary revenues. “It’s all a bit of fog isn’t it?” says Swan. Swan’s suggestion draws our attention to an issue that has long bedevilled scholarly publishing — a serious lack of transparency. Several decades ago scholarly publishers all but ceased selling individual subscriptions to journals. Instead, they began bundling hundreds of journals together into large packages — a sales technique that came to be known as the Big Deal. These packages are then sold on a multi-year basis, and on the condition that librarians sign NDAs to prevent anyone else knowing what they paid. Such lack of transparency is an issue that was raised on a number of occasions during the evidence sessions of the BIS Inquiry. 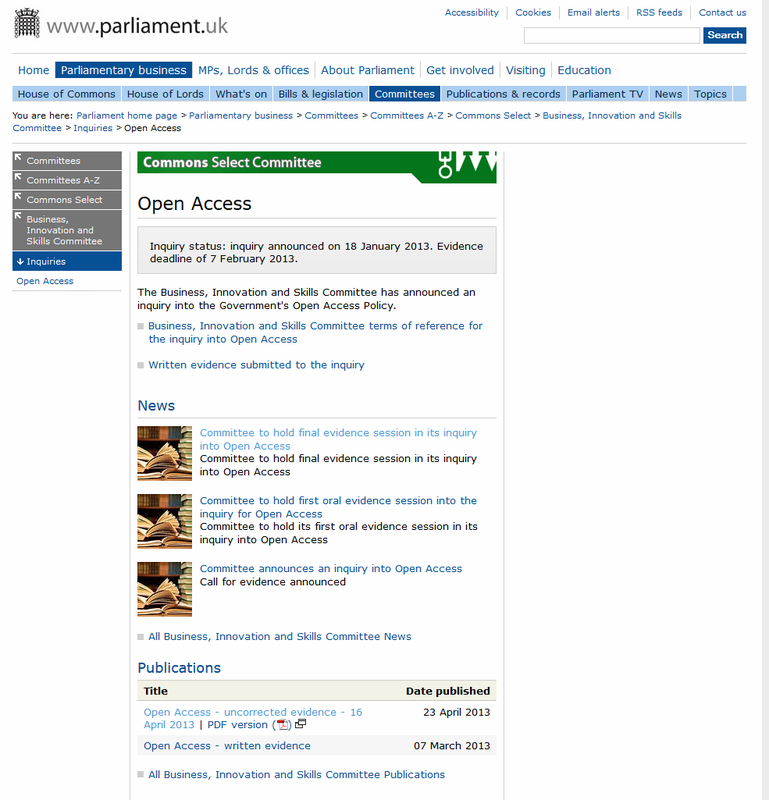 And during the final evidence session Labour MP Ann McKechin pointed out to David Willetts that the non-transparency clauses that publishers use to prevent libraries from understanding the “real price in the market” of journals means that they are unable to drive down costs. Willetts replied that while such clauses could “leave a nasty taste in the mouth” the government had no legal power to prevent their use. Clearly, therefore, when considering OA pricing a key issue is whether it will prove more transparent than the subscription model, and so ensure a competitive market emerges. OA advocates have always argued that it will, on the grounds that the buying decisions will be made by the users of the service (authors), not intermediary librarians. In addition, they assert, these buying decisions will be made on a paper-by-paper basis. This could hardly be described as a transparent process. And we must doubt that it is a cost effective way of doing things. We should note that the paper in question was published not by Elsevier, but by the American Chemical Society (ACS), but (as noted) it is hard to see how Elsevier’s prepayment system would be any more likely to encourage a competitive marketplace to emerge. Nor presumably would RCUK’s block grant approach. In fairness we should also point out that Elsevier is not the only publisher to have been accused of seeking to take advantage of the RCUK policy. During the last evidence session of the BIS Inquiry, for instance, members’ attention was drawn to an (unnamed) publisher who recently introduced a 24-month green embargo. Previously, authors were permitted to deposit their papers in their institutional repository without any embargo at all. It was suggested to committee members that the publisher had introduced the embargo as a direct response to RCUK’s policy (which now permits embargoes of up to 24 months). As it happens, OA advocates had predicted that publishers would respond to RCUK’s policy in just his way. Nor would it have been hard to predict: scholarly publishers dislike Green OA intensely, and they dislike it because it is the only way that the excessive profits currently being made from journal publishing can be curbed. That is, Green OA would force publishers to downsize their operations and focus on the only task that is required of them in an online environment: managing peer review. Agreeing that the sudden introduction of a 24-month embargo by a publisher that previously had no embargo was a worrying development, the BIS Committee asked Ron Egginton — who works in the Research Funding Unit of BIS — to speak to Alma Swan and investigate the matter. But while this incident reminds us that Elsevier is not the only publisher to attract criticism, it is nevertheless the publisher most frequently criticised by the research community. There are good reasons for this. Elsevier consistently earns profits of 36% and more (profits that in an earlier inquiry into scholarly publishing one MP suggested other companies would give their eye teeth for). And it has lobbied aggressively against Open Access — most notoriously last year when it supported the infamous US Research Works Act (RWA). If it had passed, the RWA would — amongst other things — have rolled back the NIH Public Access Policy, and so dealt a huge blow to the Open Access movement. Unsurprisingly, it was these two reasons that were cited last year when over 13,000 researchers committed to boycott Elsevier. It was for these reasons too that on hearing that Elsevier had acquired Mendeley — the free reference manager and PDF organiser — Mendeley users immediately began to delete their accounts. And it is for these reasons that researchers keep the company under constant scrutiny. And it was as a result of this constant scrutiny that SPARC Europe was able to bring a further issue to the attention of the BIS Committee. 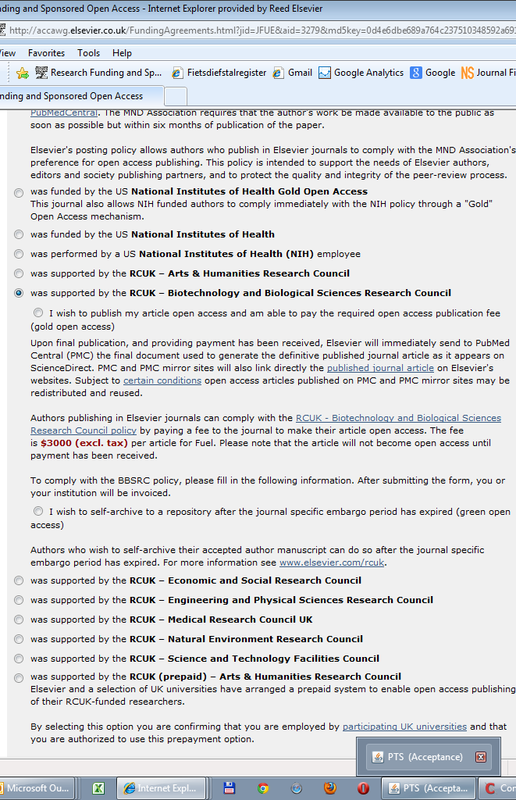 Referring members to a recent blog post by University of Sussex physicist Peter Coles entitled “Desperate Publishers”, SPARC suggested that Elsevier has been seeking to convince researchers funded by UK research councils that Gold OA is the default position, and that they must therefore pay to publish. In the post SPARC referred to Coles describes how when a colleague went online to publish a conference paper via Elsevier’s electronic submission system, he was led to believe that he had no choice but to pay an article-processing fee. I suggested to Wise that the best way of demonstrating that Coles was wrong would be to send me a screenshot of the submission screen. She agreed to do so and the image can be seen below. Let’s finish then by asking a question: Is Elsevier unfairly singled out for criticism? I put it to Wise that if Elsevier is singled out by critics, this is not without cause. After all, the company was very antagonist towards Open Access historically, not least through its support for the RWA. Moreover, I added, although Elsevier eventually withdrew its support, the publisher has never issued a public apology for having supported the bill in the first place. This is doubtless true. Moreover, it would seem that Elsevier is sometimes damned not for its actions, but for the company it keeps. A good example of this occurred on 17th May, when OA advocate and director of Harvard’s Office for Scholarly Communication Peter Suber drew attention to a misinformed attack on the White House Memorandum on Expanding Public Access to the Results of Federally Funded Research and the various state-level bills designed to expand access to publicly funded research in the US. “I haven't seen this kind of motivated distortion since the days of PRISM and the Research Works Act,” commented Suber. “[I]t's a crude bolus of false assertions and assumptions. Since Elsevier is a member of the organisation that published the attack — the industry group NetChoice — it was assumed that the text had been drafted by the publisher. In the event, it turned out that the executive director of NetChoice had written it. Nevertheless, as Suber’s post began to attract the attention of OA advocates Wise, along with Elsevier’s Vice President and Head of Global Corporate Relations Tom Reller, had to move quickly to damp down a potential tweet storm protesting the company’s involvement in NetChoice. “Just because we're a member doesn't mean we c everything,” tweeted Reller. “[W]e did not draft/see the pub, & have serious concerns re tone and wording,” Wise added. Subsequently, Reller told the Times Higher Education that Elsevier had expressed to NetChoice its “serious concern about the tone and content” of the posting and the “lack of transparency in the process by which [it] was developed”. Let’s be clear: there is no reason to suggest that Elsevier is anything other than a respectable company doing what its shareholders rightfully demand of it – maximising profits. Both Swan and Prosser agree on that. But this is no longer an issue of corporate probity alone, it is also about how, in the process of pursuing its legitimate commercial interests, Elsevier increasingly finds itself at variance with the expectations and aspirations of the research community. And once again, this is an issue that doesn’t concern Elsevier only. It also concerns the unnamed publisher that recently introduced a 24-month embargo where none previously existed, and it concerns all those other publishers who pride themselves on their aggressive pursuit of profits — companies, for instance, like Taylor & Francis (which recently saw the entire editorial board of one of its journals resign in protest), and to Wiley (currently bemoaning the fact that Science Europe has failed to adopt the RCUK model for OA, and aghast that it believes Hybrid OA as currently conceived is not viable). As these traditional publishers begin to embrace OA they bring their aggressive commercial instincts and habits with them. The problem is that researchers have become more averse to these habits in recent years, increasingly viewing them as out of tenor with the aims and objectives of OA, and indeed of scholarly communication at large. Above all, there is a much greater awareness that scholarly publishers are enriching themselves courtesy of taxpayer’s money. For the moment, however, the frustration for advocates of OA is that, however out of sympathy with this restless pursuit of profits researchers might now be, when it comes to getting a paper published they know that these companies still control most of the journals they feel they have to publish in if they want to advance their careers. Amongst the papers published in the latest issue of Elsevier’s Journal of Informetrics, for instance is one co-authored by David Solomon. (The article can be purchased from Elsevier for $27.95 here). Solomon, we should note, is a founding member of the Open Access Scholarly Publishers Association (OASPA), a founder of the open-access journal Medical Education Online (MEO), and a professor in the Department of Medicine and OMERAD at Michigan State University. And that is the hugely complex and often contradictory landscape that the House of Lords Science & Technology Committee and the BIS Committee have had to struggle to get to grips with. 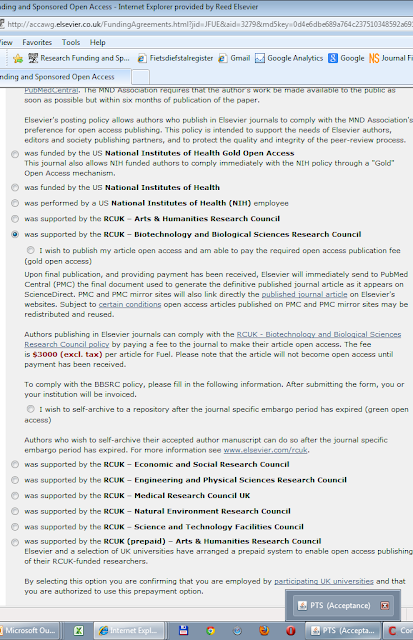 This policy restores author choice, moots publisher embargoes, makes Gold and CC-BY completely optional, provides the incentive for author compliance and the natural institutional mechanism for verifying it, consolidates funder and institutional mandates, hsstens the natural death of OA embargoes, the onset of universal Green OA, and the resultant institutional subscription cancellations, journal downsizing and transition to Fair-Gold OA at an affordable, sustainable price, paid out of institutional subscription cancellation savings instead of over-priced, double-paid, double-dipped Fool's-Gold. And of course Fair-Gold OA will license all the re-use rights users need and authors want to allow.